Makenzie is a good friend of mine, and also happens to be a fellow photographer! I LOVE the opportunity to photograph other photographers, it's a unique experience getting them on the other side of the camera. She owns Makenzie Photography, and takes absolutely beautiful portraits. I was honored that she chose me to take hers! I love hanging out with Frontier High's photography class, and apparently they like me too, because they keep inviting me back to join their field trip photo shoots. 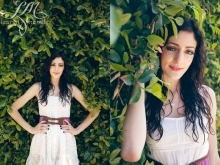 This ridiculously gorgeous girl is graduating from Fresno State! Katie is such a sweet friend of mine. I've known her family for years, and I am so proud and excited for her! She was in Tehachapi for a little bit, so we did some photos for her announcements. Congratulations Katie, you're gonna do great things.